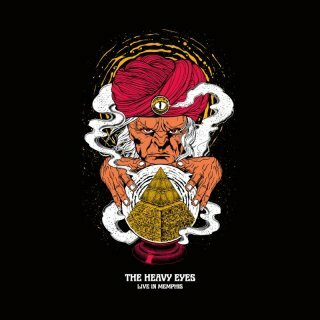 Of the many heavy rock jam bands that truly need to be seen to believe, The Heavy Eyes, are firmly at the top of that list. The Memphis power-trio are the epitome of everything that is good about modern day rock. Originality, energy, musicianship, ballsy and straight up groovy - these guys have firmly established themselves as one of the best underground heavy rock acts on the scene today! Now, for the first time, The Heavy Eyes bring the unique raw energy of their live shows to vinyl, with Live in Memphis. Recorded during a hometown show back in 2017, Live in Memphis is a 13 track set list that takes you on a journey through The Heavy Eyes full discography, featuring classics taken from "He Dreams of Lions", "Maera" and "The Heavy Eyes" debut, as well as older material only found on their earlier EP's. Live in Memphis is an experience to behold and a must have record for any Heavy Eyes fan.